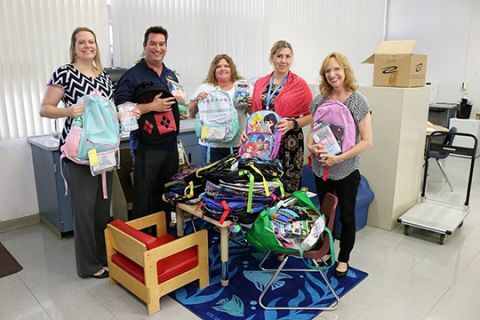 The Cordova Recreation and Park District staff and Folsom Cordova Unified School District’s Homeless Services staff are working together to provide youth in need with backpacks and underwear. From left to right: Danielle Jones, CRPD Clerk of the Board and Executive Assistant; Patrick Larkin, CRPD District Administrator; Rebecca Budge and Galina Padure, Program Assistants with FCUSD Homeless Student Services; and Gail Bair, CRPD Administrative Specialist. RANCHO CORDOVA, CA (MPG) - In early spring of this year, Patrick Larkin, the District Administrator for the Cordova Recreation and Park District, turned to community partner Rebecca Budge, a Program Assistant for the Folsom-Cordova Unified School District’s Homeless Student Services, to find out what area youth need most. Upon hearing the answer, the Cordova Recreation and Park District launched “We’ve Got Your Back,” a backpack and underwear drive for elementary to high school aged youth. Last week, Cordova Recreation and Park District made their first delivery to Rebecca Budge, who will work to distribute donations to those that need them most. This first delivery included over 50 contributions made by a combination of district residents and CRPD employees. A number of teens, all members of the Cordova Recreation and Park District’s HYDE Out Teen Center, also joined the “We’ve Got Your Back” effort. During their afterschool program, the teens personalized the district’s plain collection containers, covering them with inspirational quotes, bright flowers and colorful designs. In addition to the backpack and underwear drive, the Cordova Recreation and Park District partners with the City of Rancho Cordova’s Homeless Outreach Team to engage and assist individuals and families experiencing homelessness and help them improve their situation. The Homeless Outreach Team, comprised of two officers, code enforcement and a Homeless Navigator, builds relationships with homeless individuals and families to assist them in finding services, education and resources to help them become self-sufficient, while also enforcing violations of the law, throughout the city. The backpack and underwear drive will continue until the close of the year and donation bins can be found at locations across the Cordova Recreation and Park District. Call 916-842-3300 for more information.